Property Maintenance in Stafford can be tricky business when the workload is piling up. One little job can suddenly turn into big projects that will require lots of time and care. Balancing a busy work life and home life can be tiring and when you add property maintenance into the mix it can all become a bit too much! However, here at Ian’s Property Maintenance, we thought we’d provide a few tips on how to nail your property maintenance in Stafford. Invest time and money: It’s essential that you invest appropriate time and money for each project. Setting aside the right amount of time will allow you to get the job done properly and save you money and effort doing the same work twice. Proactive, not reactive: “A stitch in time saves nine”. Don’t let the work pile up or get worse. Leaving the problem won’t get rid of it. It will just end up getting worse and costing you more! Shop around for the best materials: You want to take pride in your home so there is no point in cutting corners. Unsuitable or shoddy materials will not last, and you’ll end up paying more to repair the work you’ve already done! 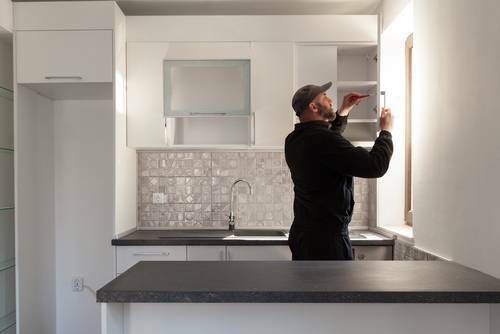 Regular touch-ups: Finally, annual checks of wiring, appliances, and a general sweep of the property will keep the workload low and eliminate the risk and cost of doing all the work at once. As always if there is any property maintenance in Stafford jobs you’re not comfortable at tackling on your own. Do not hesitate to get in touch with a member of the Ian’s Property Maintenance team today. We work right across the Stafford area and can take care of any number of jobs around the home. From the smallest to the biggest.